I'm a spokeslistener. And I've heard what you've been saying. And I’ve heard what you’ve been saying about TV — because I listen in an industry that doesn’t. And I’m fighting for every TV-loving man, woman, and child out there. DISH introduces teh Flex PackTM, where viewers can create their own TV package based on what they love to watch - with the ability to add and drop Channel Packs any time they want. Say goodbye to TV conflicts. DISH unveils Hopper 3 Smart DVR with 4K-compatibility, and the ability to record up to 16 shows at once. 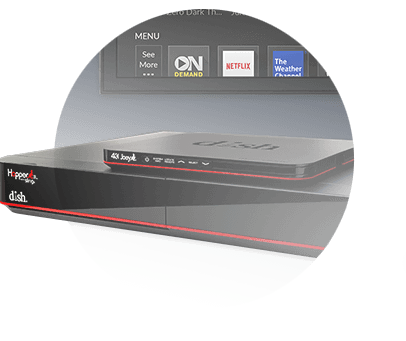 TV lovers get the most advanced DVR ever to record all their shows, binge-watch freely and have more recording space than ever before. The 2-Year TV Price Guarantee is launched, giving viewers the same price on their TV package for 24-months of worry-free TV. DISH becomes the first pay-TV provider to integrate Netflix into its Hopper letting people access their favorite Netflix shows and movies easier than ever. The Wireless Joey debuts making unsightly TV cords and wires a thing of the past. Viewers can now put their TVs anywhere there is a power outlet. 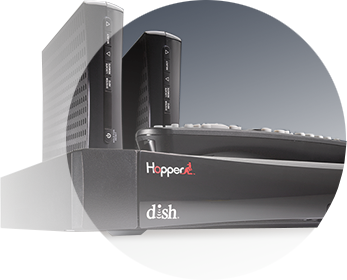 DISH introduces AutoHop®, and the Hopper® and Joey® whole-home HD DVR system. 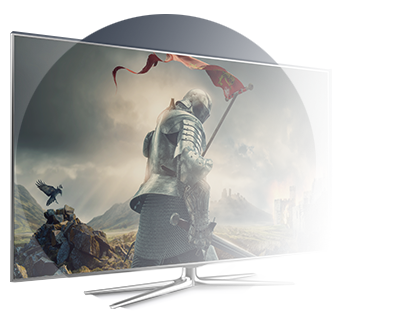 With the AutoHop® feature, viewers get commercial-free TV by skipping commercials faster. 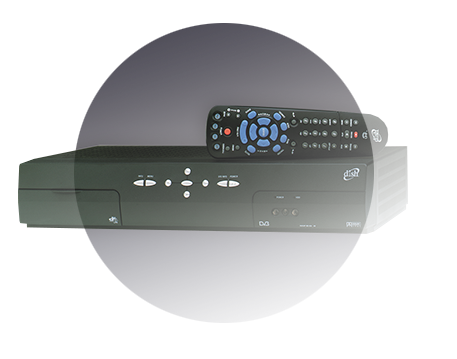 While the Hopper® and Joey® give TV lovers the ability to watch their recorded shows in HD in any room. 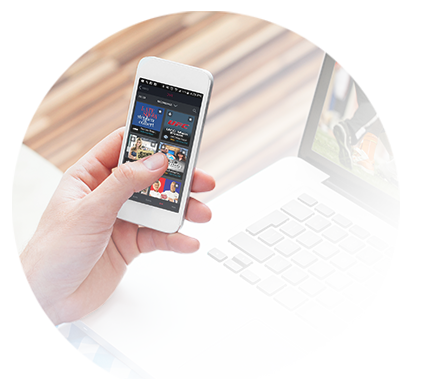 DISH Anywhere is born, giving viewers 100% of their live and recorded entertainment on the go. The DVR is born. 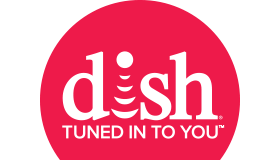 DISH introduces a satellite-TV receiver with a new and improved personal video recorder, and changes the way people record and watch TV forever. 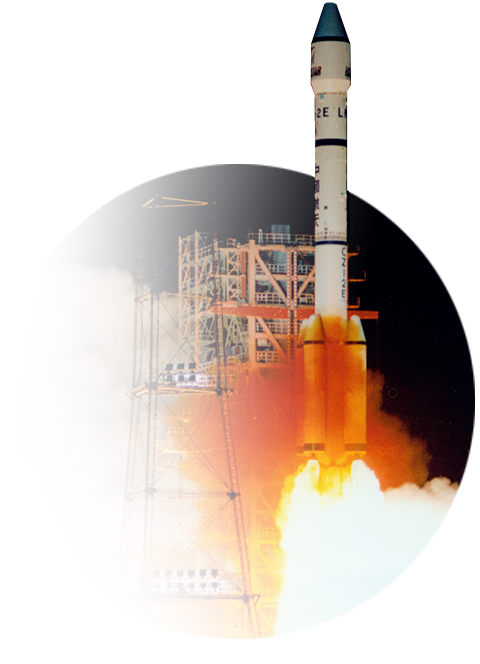 The Echo I satellite launches and provides TV for Americans all across the country. Three people – Charlie Ergen, Candy Ergen and Jim DeFranco – were hauling an enormous C-band TV dish antenna via pickup truck to a customer in remote Colorado. In the early 1980s this was one of only two dish antennas owned by the developing new business. A powerful gust of wind whipped up, blowing the antenna off its trailer and into a roadside ditch. There goes half of the company. Summed up as a bad day in the infancy of DISH, the founding trio overcame this setback to build what is now a Fortune 250 company that employs thousands and serves millions throughout the nation – a seemingly unlikely future on that blustery day. Three people – Charlie Ergen, Candy Ergen and Jim DeFranco – were hauling an enormous C-band TV dish antenna via pickup truck to a customer in remote Colorado. 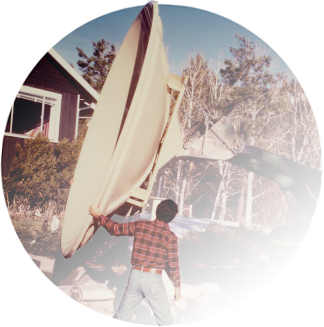 In the early 1980s this was one of only two dish antennas owned by the developing new business. A powerful gust of wind whipped up, blowing the antenna off its trailer and into a roadside ditch. There goes half of the company. Summed up as a bad day in the infancy of DISH, the founding trio overcame this setback to build what is now a Fortune 250 company that employs thousands and serves millions throughout the nation – a seemingly unlikely future on that blustery day. All offers require credit qualification, 24-month commitment with early termination fee and eAutoPay. Prices include Hopper Duo for qualifying customers. Hopper, Hopper w/Sling or Hopper 3 $5/mo. more. Upfront fees may apply based on credit qualification. Offer ends 7/10/19. After 6 months, you will be billed $9.99/mo. for DISH Protect Silver unless you call to cancel. Premiums included for 3 months: After 3 mos., you will be billed $20/mo. for Showtime and DISH Movie Pack unless you call to cancel. "The Hopper 3 is the most ludicrously powerful cable box ever." DISH keeps people connected to the TV they love. Qualification: Advertised price requires credit qualification and eAutoPay. Upfront activation and/or receiver upgrade fees may apply based on credit qualification. Offer ends 6/21/17. Included in 2-year price guarantee at $39.99 advertised price: Flex Pack plus one add-on Pack, HD service fees, and equipment for 1 TV. Available with 2-year price guarantee for additional cost: Programming package upgrades ($54.99 for AT120+, $69.99 for AT200, $79.99 for AT250), monthly fees for additional receivers ($7 per additional TV, receivers with additional functionality may be $10-$15) and monthly DVR fees ($10). Premium Channels: All offers require credit qualification, 2-Year commitment with early termination fee and eAutoPay. HBO included for 12 months with all America's Top Packages. After 12 mos., then-current everyday price applies unless you call or go online to downgrade. Premium channels Cinemax, Showtime, Starz and DISH Movie Pack free for 3 mos., After 3 months, you will be billed $45/mo for Cinemax, Showtime, Starz and DISH Movie Pack unless you call or go online to cancel. Other: All packages, programming, features, and functionality are subject to change without notice. After 6 mos., you will be billed $8.99/mo. for Protection Plan unless you call to cancel. After 2 years, then-current everyday prices for all services apply. For business customers, additional monthly fees may apply. Free standard professional installation only. 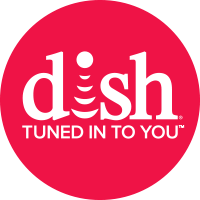 © 2017 DISH Network L.L.C. All rights reserved.